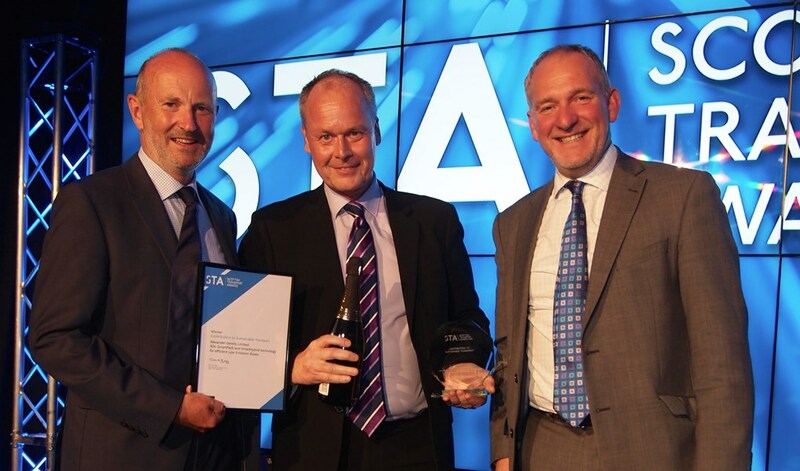 Alexander Dennis Limited (ADL) has won the 2018 Scottish Transport Award for Contribution to Sustainable Transport with its SmartPack and SmartHybrid technology for efficient diesel Low Emission Buses. The technology is used by bus operators across the country to improve air quality in towns and cities. SmartPack and SmartHybrid are efficiency enhancements for Euro 6 diesel buses, reducing emissions and improving fuel economy to make the provision of bus services more costefficient and sustainable. Keith Watson, ADL Customer Development Director, accepted the award and commented: “We are delighted with this recognition of our efforts to provide an affordable means of delivering cleaner buses on a large scale. Combining low emissions with low investment cost over conventional buses, ADL Enviro200 and Enviro400 buses with SmartPack and SmartHybrid efficient diesel technology are part of the solution to the air quality challenge not only in Scotland.” SmartPack is centred on the smart management of alternator and air compressor, which are controlled to only charge during vehicle deceleration when they place no additional load on the engine. This is combined with engine stop/start technology, which ADL was the first manufacturer worldwide to bring to market in a diesel bus, as well as electrically-driven cooling fans and a vehicle mass reduction through structure optimisation. SmartPack has been available since 2016 on most variants of the market-leading Enviro200 single deck and Enviro400 double deck buses, which together account for over 60% of all new diesel buses registered in the United Kingdom. Enviro200 and Enviro400 buses with SmartPack are accredited as Low Emission Buses by the Low Carbon Vehicle Partnership (LowCVP), in whose tests the technology delivers an 18% reduction in well-to-wheel greenhouse gas emissions compared with a Euro 5 bus on the Enviro400, and a 24% reduction on the Enviro200. They qualify for grants from the Scottish Green Bus Fund. First in West Lothian is using the technology to reduce emissions on services from Bathgate and Livingston into Edinburgh city centre. Similar funding was awarded to First Glasgow and First Aberdeen and led to the introduction of low emission buses in these cities. 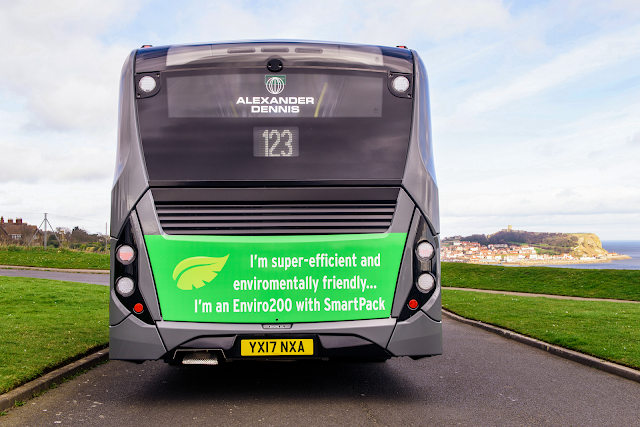 Other Scottish operators, including Stagecoach and independent Whitelaws Coaches, have also invested in ADL low emission buses with SmartPack technology. SmartHybrid is now available on the Enviro400 double deck bus and with a 33% well-towheel reduction in greenhouse gases also is a LowCVP-accredited Low Emission Bus technology. It builds upon SmartPack and adds a 48V hybrid system, which recovers kinetic energy during vehicle deceleration, stores it on-board, and uses it to provide a torque assist to the driveline when required during subsequent acceleration. The energy storage is supercapacitor based rather than using batteries, removing the need for component replacement during the vehicle’s normal operating life. The development of SmartPack and SmartHybrid has formed part of a wider investment by ADL in the development of low and zero emission technologies for buses. This multi-year, multi-million pound programme has been financially supported by the Scottish Government through Scottish Enterprise.